PEEPS Brand Marshmallow is making the holiday season more festive with new flavors and shapes arriving just in time for the season of giving. Plus the mischievous yellow-colored Minions from the "Despicable Me" movie series have taken over nearly the entire PEEPS Holiday collection for 2014! Meet the three official PEEPS Taste Testers" Stuart, Kevin, and Dave - who are busy making sure PEEPS holiday treats are impeccable for stocking stuffers, colorful additions to baked goods and adorable accents to art projects. To Honor the PEEPS Minions taste testers, for the first time PEEPS created a Minion-shaped marshmallow reflecting their fun PEEPSONALITY, plus enjoy limited edition comics on the back of the package made exclusively for PEEPS by Universal Studios filmmakers. SRP $1.29 - $1.69 for a six count package. New for 2014, delectable hot cocoa-inspired marshmallow chicks dipped in white fudge - the Minions fully approve of this fireside indulgence. SRP $1.99 - $2.49 for a three count package. New for 2014, peppermint flavored marshmallow chicks remind the Minions of sweet candy cane bliss. SRP $1.69 - $2.99 for a ten count package. Fluffy Snowmen-shaped marshmallows come to life in this larger size for 2014; the Minions also decorated them with a red scarf and black buttons. SRP $1.69 - $2.29 for a one count package, and $1.09 - $1.69 for a three count package. Delightful Candy Cane flavored marshmallow chicks dipped in chocolate and sprinkled with red speckles. SRP $.199 - $2.49 for a three count package. Green tree-shaped holiday marshmallow decorated with red, yellow and blue garland and topped with a star. SRP $0.79 - $0.99 for three count package, $1.39 - $1.69 for nine count package. 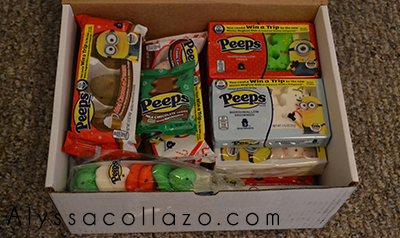 My girls loved just about every package of Minion PEEPS. Their favorite was the Chocolate dipped Candy Cane flavor. They went well with a cup of hot cocoa. My favorite was the Marshmallow Minions, I enjoyed reading the comics on the back of the package to my girls and the originality of the flavor brought me back to when I was a kid. My fiance aka our Taste Tester loved them all, his favorite was the Large Snowmen. Mint Marshmallow trees covered in milk chocolate. SRP $.79 - $0.99 for individually wrapped tree. Gingerbread flavored marshmallow in smiling gingerbread men shapes SRP $0.79 - $0.99 for three count package, $1.49 - $1.69 for six count package. Bakery-inspired Sugar Cookie-flavored marshmallow chicks dipped in mouthwatering milk chocolate. SRP $1.99 - $2.49 for a three count package. Four assorted green, red and white festive marshmallow chicks on a stick. SRP $1.99 - $2.29 for a four count package. Another set of favorites in my house. I really enjoyed the Mint flavored tree. It was pretty cool the marshmallow inside was green! As you can see PEEPS really does make the perfect stocking stuffer for any age. They are also great for baking or putting in a cup of hot cocoa! Which flavor of PEEPS are you excited to try? Be sure to follow PEEPS on Facebook, Twitter, and Instagram. DISCLAIMER: All products received are complimentary for testing purposes from PEEPS. All opinions stated are my own and are not influenced by any affiliates. Oh I love peeps! Its so fun that its not just for Easter anymore. They are coming out with so many different designs and flavors. I have to get the minions ones for my daughter. I want to try the chocolate covered mint marshmallows! My kids would LOVE the minions!! Thats a lot of Peeps. I only like Easter Peeps as they are my favorite ones. I'd love to try chocolate ones in my hot cocoa! 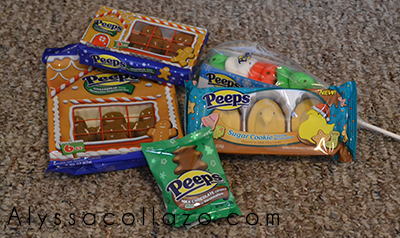 I always love reading about the holiday peeps when they come out but can never seem to find them. I wonder where I should be looking exactly. I love Peeps! We always make chocolate covered ones and my son is going to flip for the Minion ones :) The candy cane ones sound good. I absolutely LOVE Peeps - I haven't seen or heard of most of these. I have got to get my hands on some of the snowmen. This is a crutch of mine.. i love Peeps all shapes, sizes and flavors.. i will need to contain myself to not get off my diet. 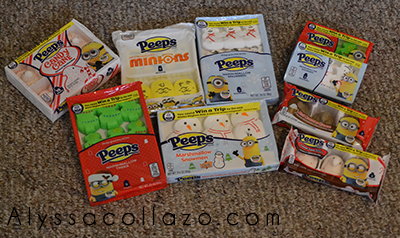 I am definitely not a peeps fan, too much sugar for me, but I know some of my nieces will love these characterized peeps! These are so cute. I haven't seen Christmas peeps before today. It would very fun to put the peeps in hot chocolate. Peeps are my fave Easter candy and I love that they're out for all the holidays now! Okay, so chocolate mint peeps sound like my kind of treat! So cute!! I can't believe they have Minion Peeps! The minis and minions are just adorable! They'd be so great topping so many things! my daughter loves peeps. i shouldn't show her this or she would be begging to get some lol .